It was 1978. Jimmy Carter was President; gas prices were soaring; and Americans were hunkering down to weather the economic crisis. But in bookstores Jim Fixx's The Complete Book of Running was a bestseller. Frank Shorter's gold medal in the 1972 Olympic marathon had put distance running in the mind of a public enamored of baseball and football. Suddenly, the odd activity of "jogging" became "running," and America was in love. That summer, a junior from the University of Oregon named Alberto Salazar went head to head with Olympic champion Frank Shorter and Boston Marathon champion Bill Rodgers at the Falmouth Road Race, losing in the last mile to Rodgers's record-setting 32:21, nearly dying in the process, and setting the stage for a great rivalry. In Shorter, Rodgers, and Salazar, running had its conflict and drama like boxing had Ali and Foreman, like basketball had Russell and Chamberlain. Each man built on what the other achieved, and each pushed the other to succeed. Their successes, in turn, fueled a nation of coach potatoes to put down the remote and lace up their sneakers. It was 1978. Jimmy Carter was President; gas prices were soaring; and Americans were hunkering down to weather the economic crisis. But in bookstores Jim Fixx s "The Complete Book of Running" was a bestseller. Frank Shorter s gold medal in the 1972 Olympic marathon had put distance running in the mind of a public enamored of baseball and football. Suddenly, the odd activity of "jogging" became "running," and America was in love. That summer, a junior from the University of Oregon named Alberto Salazar went head to head with Olympic champion Frank Shorter and Boston Marathon champion Bill Rodgers at the Falmouth Road Race, losing in the last mile to Rodgers's record-setting 32:21, nearly dying in the process, and setting the stage for a great rivalry. In Shorter, Rodgers, and Salazar, running had its conflict and drama like boxing had Ali and Foreman, like basketball had Russell and Chamberlain. Each man built on what the other achieved, and each pushed the other to succeed. Their successes, in turn, fueled a nation of coach potatoes to put down the remote and lace up their sneakers. "Kings of the Road" tells the story of running during that golden period from 1972 to 1981 when Shorter, Rodgers, and Salazar captured the imagination of the American public as they passed their figurative baton from one to the other. These three men "were "American running during those years, while the sport enjoyed a popularity never equaled. As America now experiences a similar running boom, "Kings of the Road" is a stirring, inspiring narrative of three men pushing themselves toward greatness and taking their country along for the ride. " Advance praise for KINGS OF THE ROAD: "Combining a novelist's eye for character and detail with an historian's insight into patterns and connections, Cameron Stracher's Kings of the Road delivers a rollicking, informed account of the rise of the American running movement. Bringing the 1970s alive in all their brokenness, weirdness, and hope, Stracher shows how distance running helped define a generation " John Brant, author of Duel in the Sun and co-author (with Alberto Salazar) of 14 Minutes "In Kings of the Road, Cameron Stracher recaptures the wonder, energy, and excitement of American road racing from 1972 to 1982. With amazing detail and action, he follows Frank Shorter, Bill Rodgers, and Alberto Salazar to their greatest victories in an era when they became national sports icons." Amby Burfoot, 1968 Boston Marathon winner and Runner's World editor at large"
"Possesses a period charm" -- Booklist"A focused survey of three unmatched American long-distance runners... Essential reading for runners both competitive and casual." 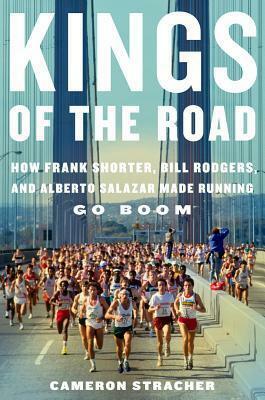 - Kirkus Reviews "Kings of the Road is about marathon legends. It's about running Fast. It's about Will. It's about the Real. It's about drama of the finest kind." - Bernd Heinrich, author of "Why We Run and Racing the Antelope" "In Kings of the Road, Cameron Stracher recaptures the wonder, energy, and excitement of American road racing from 1972 to 1982. With amazing detail and action, he follows Frank Shorter, Bill Rodgers, and Alberto Salazar to their greatest victories in an era when they became national sports icons." --Amby Burfoot, 1968 Boston Marathon winner and "Runner's World" Editor-at-Large"Combining a novelist's eye for character and detail with an historian's insight into patterns and connections, Cameron Stracher's Kings of the Road delivers a rollicking, informed account of the rise of the American running movement. Bringing the 1970's alive in all their brokenness, weirdness, and hope, Stracher shows how distance running helped define a generation. Kings of the Road rekindles Baby Boomer memories while introducing younger readers to an overlooked piece of sporting and social history." - John Brant, author of "Duel in the Sun" and co-author (with Alberto Salazar) of "14 Minutes"